I played selections from the first movement of the Tomasi trombone concerto for Colin during his class. The main point that he tried to make to me is not to get too caught up in the small elements of rubato– think about the big picture. I had/have trouble with this aspect in my playing, especially in the Tomasi with the vast number of markings. I’m trying to work on not, for lack of a better word, romanticizing every small gesture, but rather striving to achieve long, sweeping musical lines. The rest of my notes from this class were directed to the other participants. In every brass pedagogy course I’ve ever taken, we always had to list “teaching points.” Think of the next statements that way; these points can be used for any brass or wind instrument. Even though it’s a waltz, play more fluidly. Make slurs much more like the human voice. Think of Bordogni No. 6 and play in all clefs. Sound more vocal or song-like. Sing a phrase to get a more natural and musical sense of phrasing. Drive wide and awkward intervals with your airstream. Work on Arban’s Articulation Styles. Think of the tongue as a traffic cop for your airstream. If you blow faster air, then the tongue can almost bounce or spring off of the airstream like a lawn sprinkler. As you may or may not know, Colin injured his lip and had to take a few months off of the horn to heal. The second half of his class developed into a Q&A about what happened to him and how we as trombonists can avoid/prevent the same thing happening to us. I do not want to necessarily hash out all of the details of Colin’s injury (I’m sure you could email him with any questions), but what he basically said was that he did too much playing without rest for about 5 years straight. On top of a very demanding workload with the Atlanta Symphony, he would push himself too hard in his individual practice sessions. Though it is good and healthy to push yourself in your practice, you must find time to rest and rebuild muscle. Colin suggested that we as brass players should find a few weeks a year not to play. Apparently even Joe Alessi takes the month of August off from his horn, according to Colin. Colin said that some warning signs might be difficulty producing a clear sound, leading to using more pressure, which can cause partial muscle tears and muscle thinning. On this same note, we must remember that being out of shape is different than not having the muscle. After the class, everyone was pretty horrified after his descriptions of feeling a white-hot needle sort of pain in his lip when the muscle tore. Honestly, most players don’t have to worry about this sort of thing. Practice smartly and efficiently, take breaks, etc. Since then, Colin is back to playing in the ASO. 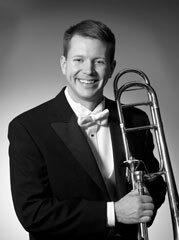 He is such a beast at the trombone and a really nice person. I can’t wait to hear him again!